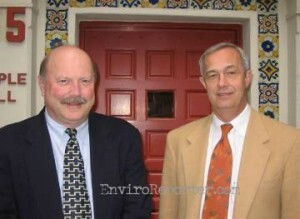 Dr. Chris Whipple, Principal of ENVIRON (Lt.) with Dr. Michael D. Pratt, Head of Brentwood School, spoke with EnviroReporter.com Jan. 30. 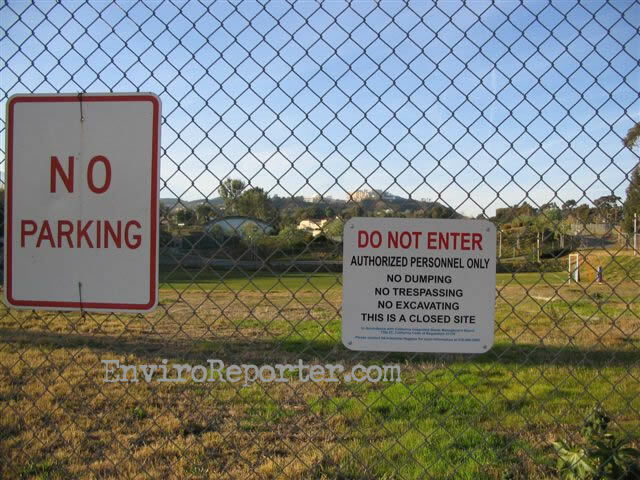 In a January 30, 2007 letter to the parents and colleagues of students of Brentwood School, Head of School, Dr. Michael D. Pratt, revealed that the exclusive private school on leased West LA VA land had hired two firms to evaluate school soil for radioactive and chemical contamination first reported by Los Angeles CityBeat and EnviroReporter.com last May. “I am delighted to report that our additional environmental testing has confirmed that there is no radiation on our school grounds above normal background levels,” Pratt wrote. Emeryville-based Dr. Chris Whipple headed an ENVIRON International team last December in a three-phase investigation and testing of the property that included surface soil testing, aquatic center soil borings, and subsurface examination of the school’s athletic fields. “We took a fair number of samples and we didn’t get any detects of tritium or carbon-14,” Whipple said. “Our understanding from the VA had always been that there never had been radioactive material buried under the site that we occupy and that in the process of excavation, no radioactive materials were found,” added Pratt. The headmaster added that another environmental firm, URS Corporation, had conducted an “independent peer review” of ENVIRON’s conclusions, giving a thumbs up. In early February, Los Angeles CityBeat received an irate call from a former student of Brentwood School, Michael Ritter, who is now the publisher of the online Saturday Night magazine. Ritter claimed that CityBeat had attributed quotes to him that were supposed to be off-the-record. The problem with his allegations was the quotes were never published in the paper. 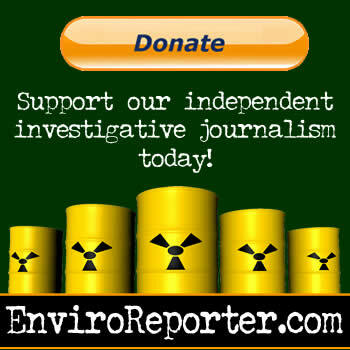 Add to that the fact that the quotes were on-the-record as Ritter had written an unsolicited e-mail to EnviroReporter.com last year when our initial expose, “Real Hot Property,” debuted in both the paper and this website. “As a student who attended Brentwood School (graduated in 2001) and who has played MANY baseball games on the Barrington Fields and who walked through the gully (that is now the athletic field) many times to play sports at the VA field, I am well aware of everything you speak about,” Ritter told us. “For [Brentwood School Assistant Headmaster] Don Winters to say ‘If any of that had been underneath the field, you can be assured that we would have had a whole different attitude about the project,’ is absolutely ridiculous. According to Pratt, Secretary Nicholson is preparing to announce that MicroTech LLC was wrong in that there was and is radioactive debris buried under Brentwood School’s athletic fields. In a January 22, 2007 letter to Nicholson, Pratt wrote that a “report MicroTech LLC prepared for the VA” that “stated that radioactive biomedical waste was buried under land Brentwood School shares with the VA” was “simply a mistake,” and requested that Secretary Nicholson clarify the situation. 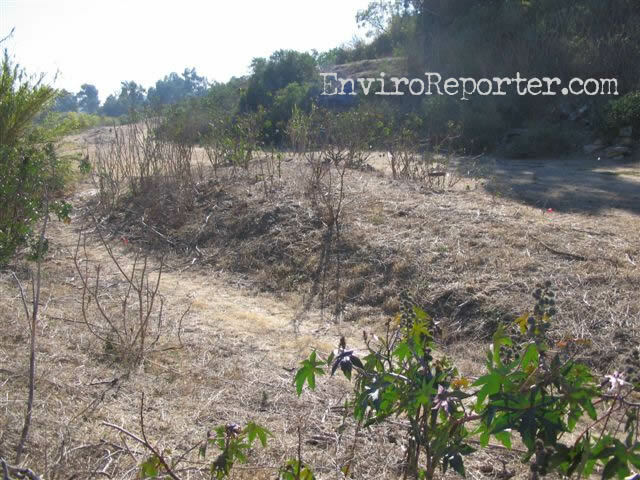 Pratt, who consults regularly with the West LA VA’s director Charles M. Dorman, apparently has knowledge of the source of this explosive PwC information that EnviroReporter.com asked for and was refused. Our request for the PricewaterhouseCoopers/VA contract to evaluate 18 VA facilities, including the West LA site, for “asset realignment for enhanced services” was heavily censored. The cost of that contract, according to a Congressional source, has climbed from $9.7 to $10.5 million. The 5,500-plus pages of VA information may or may not contain the answers regarding radioactive waste under Brentwood School that Waxman seeks. The Congressman’s staff has not fully reviewed the mass of documents but already has noted what is missing: information pertaining to the VA’s sharing (leasing) agreements with Enterprise Rent-A-Car and Fox Studios. VA testing contractor, Millennium Consulting, says its Phase One report is due early February even though its promised testing is incomplete. Indeed, broad swaths of land slated for walk-over testing, shown on page 14 of the plan, were missed, including the inclines of the dump’s main arroyo, land adjacent Brentwood Theatre, and most of Brentwood School. Though Millennium’s Phase Two testing begins this Spring with 80-foot deep soil borings, groundwater analysis and risk assessment, Millennium chief Michael Noel says he won’t be revisiting Brentwood School. “It has been more than adequately addressed,” Noel said Jan. 30. But has it? Not according to Ramberg who points out that six of ENVIRON’s borings were in a small area under construction for a pool not known to have any dumped material, while just four successful borings were made in areas known to possibly have radioactive ash waste that could have been the result of the incineration of hot lab waste and animals years ago. Yet even those known ash pits’ placement on the school’s property by ENVIRON have come into question. The result of the school contractor’s map is a lateral ‘shifting’ of where the dump actually is on page 15 of ENVIRON’s report compared with a pre-1980 map and 1995 map of the known dump. However, the actual placement of the three ash pits on the school property seem to roughly correspond to the 2000 Locus map that Environ used for reference. Ramberg also noted that the school is pressing the VA to confirm that not only is there no radioactive waste buried on its property, but also that there never was. 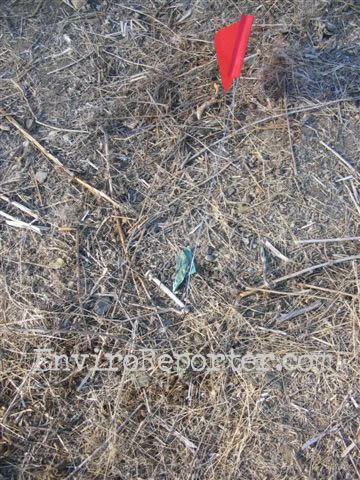 This could seem odd in light of the large debris mound in the center of the known dump that the VA told EnviroReporter.com in January 2006 was a result of excavating waste from under Brentwood School’s fields. The mound’s ambient radiation is twice normal background and shards of radioactive glass and a ‘hot’ syringe were found next to the mound. The syringe still lays on the ground although Noel had said he would have it analyzed for radiation. Whether any Phase Two boring takes place at all remains to be seen. Until then, the dump still remains insecure, with one of its gates wide open the last time EnviroReporter.com visited the site which is adjacent MacArthur Field. 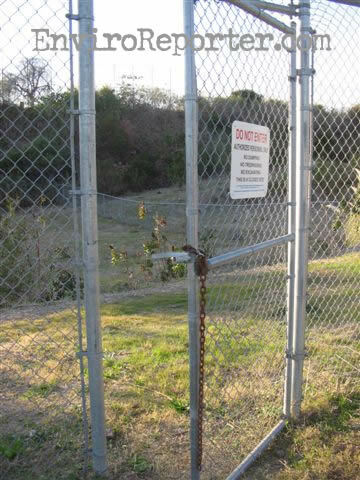 One of the only things warning the public of the dangers of the dump, are new metal signs that prohibit trespassing or excavating. 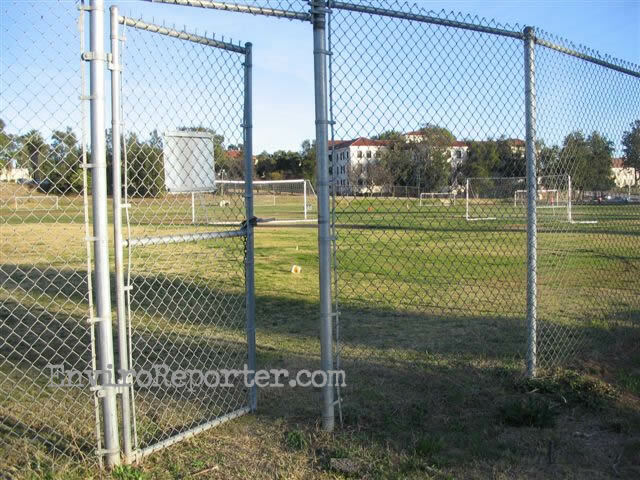 Ironically, one of these “DO NOT ENTER” signs abuts a Brentwood School soccer field, giving the wrong impression that the moneyed institution is off-limits. With the release of Millennium’s Phase One report imminent, with no abnormally high radiation to be reported according to Noel, what will the results reveal? The “walk-over” examination of the areas Millennium actually did test, while useful for detecting gamma radiation which travels great distances, wouldn’t have detected buried tritium or carbon-14. These low-energy beta radiation emitters can’t be readily detected with a surficial sweep because of the inch or less they radiate.